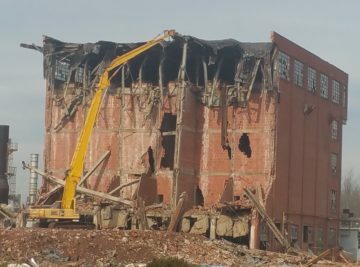 Decades of manufacturing at this location resulted in environmental contamination, which prohibited a traditional real estate transaction. CDC’s environmental liability transfer and remediation plan enabled Congoleum to sell their surplus facility, divest legacy environmental liabilities, and guarantee environmental clean-up and demolition at the site. CDC oversaw subcontractor demolition operations for this project, which involved demolition of non-essential buildings totaling 1.1 million sq/ft.